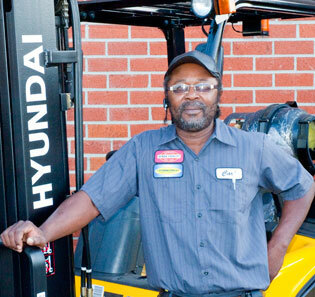 Hyundai Forklift of Southern California: Looking for Forklift parts - Do you know Carl? Looking for Forklift parts - Do you know Carl? There are a lot of parts on a forklift. Take a look at the picture to the right. There are also a lot of forklifts that need parts. There have been at least a hundred forklift manufacturers over time and together they have produced several hundred different forklift models. Do you need a tire, a hydraulic pump, an o-ring, engine components, etc..? 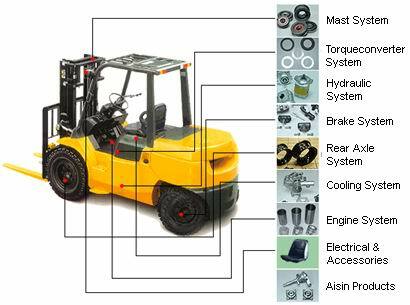 You can buy new forklift parts, aftermarket forklift parts, used forklift parts or rebuilt forklift parts. There are so many factors you need to know to find the right parts for your forklift. So how do you source the right parts to repair your forklift? Who is Carl you may ask? This is Carl. Carl is the Parts Department Manager at Hyundai Forklift of Southern California. For over twenty years, Carl has been researching and cultivating supplier relationships in an effort to better service his clientele. Carl has vendors that provide new parts. He has vendors that can rebuild parts. He even has vendors that can make new parts to match your broken parts. When discussing with Carl what he feels he offers of value to his customers, Carl says that during the twenty years he has been in the parts business, he has made all the mistakes so you don't have to. Carl feels that he has come to learn how critical patience and respect are in providing his customers with the best service possible. He likes to help his customers identify the correct part for their situation. Carl says he remembers helping one customer who called up asking for a fan blade. After a lengthy discussion trying to identify the proper part for his customer, he realized that what the customer was really looking for was an aircraft propeller for his airplane. Most of Carl's regular customers will tell you that Carl is a hard-working person who listens to his customers and always gets back to them promptly. These are traits they value greatly. When asked why people should call him about forklift parts, Carl responds, "because I do this every day and they may only do it once in a while." He continues, "I know where to find the best forklift parts and find them quickly. But most importantly, I know where to find the best deals so that I can save my customers money." So, why bother trying this yourself? Call Carl! Carl is married to his wife Vesta and they have three kids. He is a Dallas Cowboys fan and loves to fish and cook. Thanks for sharing this article with us! We are thankful for our Veterans!